We can fix your Apple 820-2915-A logicboard! We have been repairing a lot of Apple logicboards lately. Of those logicboards we repair we see many from the Apple A1286 series which include the 820-2915-A and 820-2915-B model logicboards. Does your screen show red lines? Does your screen have scrambled video? Does your screen have horizontal lines on it? Does your MacBook not chime but you hear fans running? Does your MacBook just show a spinning wheel? Have you upgraded your MacBook to Apple OS X Yosemite and started experiencing video issues? If your answer to any of the questions is yes we can help you. We have fixed over 100 Apple 820-2915-A models in the past year. The error affects both i5 and i7 Intel processor models with the Nvidia chipset. What does it take to fix this unit? 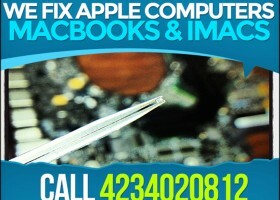 We can fix your Apple MacBook with red lines, scrambled video, or scrolling horizontal lines. 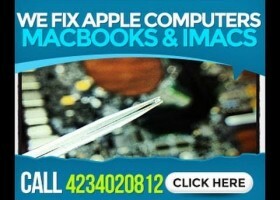 To fix these models you will need both tools and the understanding of how to disassemble a MacBook 15 inch unit. We use specialized machines to remove your chipset, replace the solder underneath it, and then replace the chipset back. This process is referred to as reballing. We perform both reballing and reflowing in our office for this unit. Are the only units affected the 15 inch MacBook A1286 series? We have also started seeing Apple A1278 13 inch MacBooks with the same error infrequently. The A1278 series will show “broken” lines and glitch. The error only displays after boot up. Q: What is the general turnaround on this Apple MacBook A1286 repair? A: Usually our repair service is 1 to 7 days. Q: Can we send the logicboard alone or do we need to ship the entire laptop? A: Yes. You can send the logicboard either way. Q: Do we need to include the hard drive if we send the entire MacBook? A: No. We do not need your hard drive to boot the system. At Doubleclickittofixit we strive to provide you with the best repair possible for your Apple laptop, desktop, or electronic device. 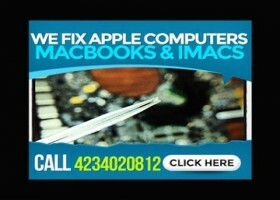 We have been working since 2009 with our mail-in repair service to fix MacBooks, iMacs, and even iPhones. We specialize in chipset repairs but perform a number of other repair services. Below you will find a list of some of the major cities that we provide repairs and service for Apple MacBook, PowerMac, iPhone, iMac, Mac Mini and other Apple electronic devices nationwide with mail-in service/repair. We can fix your Apple 820-2915-B logicboard! If your answer to any of the questions is yes we can help you. We have fixed over 100 Apple 820-2915-B models in the past year.